Digital calipers have been around for a long time, but being a bit old fashioned I’ve kept to a vernier caliper that was bought for me by an uncle when I was a lad. Well, they have got so cheap that the other day I just could not resist. These calipers are available from many different outlets, however, most are made in China and I imagine that most are made in the same factory – if you know more about this then let me know as I would be interested. The caliper can measure inside, outside and depth. The readout is large and clear with simple clear buttons. In addition it also has an auto shutoff, which if you’re like me you will leave this lying about and powered up. One thing I’ve not shown here is that it comes in a nice plastic case with a tight fitting foam inner to protect the caliper. Also, mine came with a spare battery – nice touch. Price: approx £12.50 (2010) from machine-dro.co.uk. Great price for a caliper that has a clear readout. There are many other suppliers and as I said earlier I imagine they are all much the same – let me know ed. 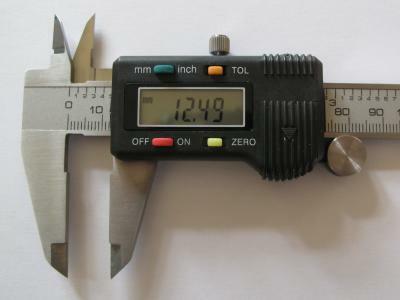 I tested the caliper against my old trusted vernier caliper and could find no differences in measurements across the range – that’s good enough for me.